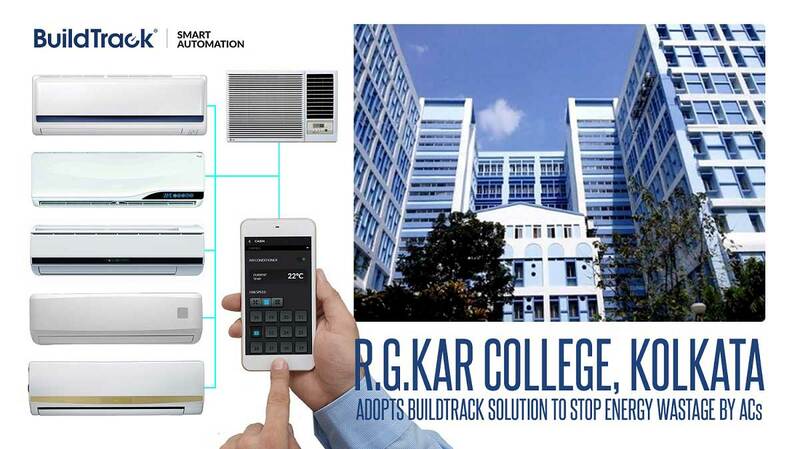 R. G. Kar Medical College, Kolkata has adopted BuildTrack’s solution to Centralized control and manages all its existing Air Conditioners distributed across the building. The operation and maintenance of the ACs in the college is the responsibility of the Public Works Department (PWD) which sought options to monitor and control them centrally. The Energy Efficiency solution installed in the building enables monitoring of the operating status of ACs, controlling the AC and temperature setting, scheduling the AC, monitoring the temperature and humidity of the rooms in which the AC’s operate. One of the unique safety features of the solution is to trip the AC when the current drawn by the AC exceeds certain pre-set thresholds. This solution is helping to reduce the energy consumption by ACs to a great extent and also ensuring reduced fire hazards due to overdrawing current. All AC’s are accessible either individually or in groups for control ON/OFF, temperature and fan level. BuildTrack Energy Efficiency Solutions help reduce the energy bill drastically. The AC Centralizing solution is unique in its ability to allow control of AC’s which is the highest energy consuming asset in most offices. The solution uses IoT technology to centralize them either in an office, a building, or an entire company. Centralizing the ACs helps avoids fire hazards by switching OFF AC’s with unacceptable power levels and also extends the life of ACs.. To learn more about this solution, Read more for zero energy wastage using sensors. About R.G.Kar Medical College (http://www.rgkarmch.org/): R. G. Kar is a medical school and hospital base in Kolkata, West Bengal, India. It is one of the leading Government Medical Colleges in the Country and has been in service for over 100 years. About BuildTrack (www.BuildTrack.in): BuildTrack is a leading brand of Smart Automation & Internet of Things products and solutions from Surmount Energy Pvt Ltd. BuildTrack solutions deliver Safety, Security, Sustainability, Comfort, Convenience and Operational Productivity. BuildTrack manufactures its own line of sensors, controller, switch nodes, cloud services, smart apps and more to deliver a number of reliable wired and wireless automation solutions for homes, offices, buildings, hospitals, hotels, warehouses, corporations, BMS, Energy Efficiency and more.